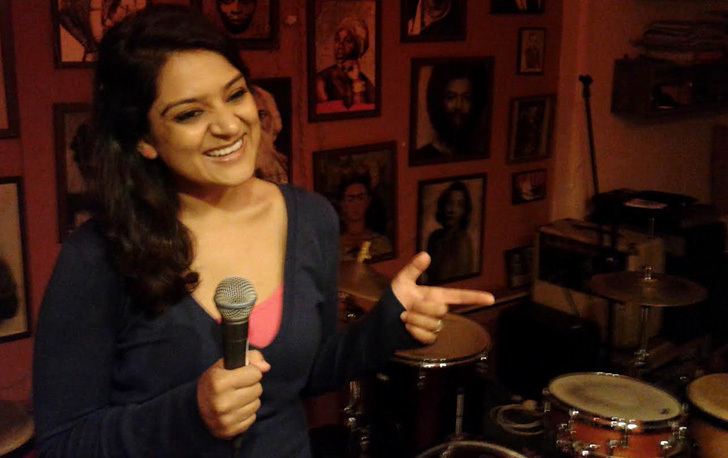 South African-born Kaneez Surka is a comedic actress who has been a big part of Mumbai's burgeoning improv comedy scene since 2009. Perhaps best known for her work with The Week that Wasn't, a popular show on CNN-IBN created by Cyrus Broacha and Kunal Vijaykar, she is also a part of popular improv groups like Improv Comedy Mumbai and the Improvisers, and has recently made the leap to stand-up comedy as well. Kaneez Surka. Photograph by Arun Kale. What was it like growing up in South Africa? I grew up in this town called Mthatha in the Eastern Cape of South Africa. It's very close to where Mandela was born. It's a completely business-run town. There's no movie houses or pizza delivery places — at least it was like that when I was growing up. It was pretty basic. No one would support any entertainment businesses in the town. It's not a very safe place, either. It's one of South Africa's more dangerous cities. My mum's been held at gunpoint three times inside shops. Yeah. We've all been held at knifepoint or gunpoint at some point in our lives (laughs). Growing up, I didn't think anything of this. It was only when I came to India when I realised that it was pretty messed up. (Laughs) Yeah, I was like, wait a minute, that's not normal. Tell me about the neighbourhood you grew up in. My dad's a doctor, and the hospital he was working at gave him a house that was just off the hospital premises. Our car would be parked between the hospital and our house. Sometimes I would get dropped off at the gate of the hospital and I would have to walk through the hospital compound to get to my house. Was that awkward for you? It was interesting, because it was a mental asylum, and the dentistry department, the psychiatry department, and the ophthalmology department, which was my dad's department, were all in the same compound. Every time I'd walk through, some or the other psychiatric patient would run after me. And I was like, oh my God, I'm doing this every day. "My mum's been held at gunpoint three times inside shops." Did they actually run after you? Yeah! Well, it wasn't dangerous or threatening. It was just playful, mostly. I was a kid. It was fun living in that compound. I actually haven't thought about it in years. My dad actually taught me how to drive in that compound (laughs). A hospital compound is the worst place to teach your kids driving! (Laughs) But I guess it's also the safest place in case of accidents. That's true as well (laughs). If something happened, there was a hospital right there. Was your mom working as well? My mum used to be a teacher until she fell in love with business. So she's a serial entrepreneur now, and running a couple of businesses that she enjoys working on. Do your parents still live in Mthatha? Yeah, my parents are still there. It was a very interesting neighbourhood, because in our childhood, all the entertainment came from house parties. The Indian community in the town would have house parties every weekend. That's still the culture now, every time I go back. Are entertainment avenues still limited in the town? Yeah, I mean, there's still no movie house. I remember someone opened a movie house and it didn't do well at all. It shut down within a year. There is a medical university in our town, though, so there are young people coming in from other places as well now. Maybe that will bring about a change in the culture. I only lived there till I was 12, after which I went to a boarding school in another city. The school was in a place called Grahamstown, about five hours away from my home. It's a really small, very English colonial town. It's a university town, and the majority of the population is from the university. It's very quaint; there's a lot of English and Dutch architecture. I went to school there and then later went to the university there as well. "There's this one moment where you just know that you can do this." Photograph by Arun Kale. Can you recall any experiences that you had in school or college that may have helped shape you as a creative person? Definitely. Grahamstown has one of the biggest arts festivals in South Africa. It happens every year around June-July. It has everything: performance art, music, paintings, all sorts of stuff. That was a part of my life every year, so that influenced me a lot. You did some theatre in school as well, right? Yeah, in grade 10, we had to choose six subjects that we had to study for the next two years. English and Afrikaans were compulsory, and for the others I chose math, science, and biology. For the sixth subject, my parents wanted me to take up accounting, but I wanted to study drama. There was a lot of back and forth, but I was convinced that I would never take up accounting. I was taking up science as well, so I could study medicine later if I wanted. I was never going to go down the commerce route, so it didn't make any sense. Were your parents supportive of your choice? My parents were very open. They didn't just come out and say no. They spoke to a lot of people who had taken up drama, just because they didn't want me to waste two years of my life doing something that wouldn't benefit me. Eventually they were convinced and I took up drama. I studied it for the next two years. In grade 10, I did a show where I played a nun. It was for a school competition, and the play was about five nuns planning a heist. I was playing a regular nun, and the play director asked me to do something different with my character. I started playing her as a very nervous, shaky nun, and I got these large, thick glasses that really magnified my eyes, and suddenly I found myself doing comedy. That was my first time doing comedy, and I said to myself, I can do this. Yeah (smiles). The character was received very well by the audience, and I really got into it. I felt really comfortable in that role. I played comedic roles in all the plays I did after that as well. In grade 12 — I'm sorry, do you want to hear this? In grade 12, I did another play where I was a nun (laughs). In those two years, I played a nun twice and a prostitute twice (laughs). Anyway, the play was supposed to be staged three weeks before my final exams. I was rehearsing for the play all through the month before my exams. Every time my mom would call my hostel to ask how my studies were going, she'd find out that I was at rehearsals. My parents started freaking out, but my dad decided to wait and see how things played out. When the play happened, it was hands down the most magical experience that I've ever, ever had on stage. The character was very similar to the first nun I played, but she had amnesia, and her name was Sister Amnesia. This is going to sound so, like, meh, but it was really like an out-of-body experience for me. There was a moment where I saw myself performing — I was singing and dancing and doing comedy, and I was completely in my element. After the play, my mom came up to me, and said, "No 'A' will make me prouder than I am today." "There was a moment where I saw myself performing — I was singing and dancing and doing comedy, and I was completely in my element." That sounds lovely (smiles). Have you spoken to any of your colleagues in the entertainment industry about this? Have any of them ever had similar out-of-body experiences at any point during their careers? Is there a moment like that that comes about in every artist's life? Yeah. There's this one moment where you just know that you can do this, that you can deliver if you were asked to. But I can't speak on anyone else's behalf. Did you study drama in university as well? I did go to university, but that was because I thought I couldn't make a living doing art, so I thought I would get a proper job and do art on the side. Law and psychology (laughs). I actually wanted to do journalism. Do journalists make money in South Africa? Yeah, actually. Over there it's actually a decent career choice. But yeah, university was just one big party. But now I kind of regret it. I wish I had actually gone to lectures and studied psychology back then, because it's such an interesting subject. That's why I really believe in adult education. Back then I didn't want to study, which is why I didn't learn anything. And now I'm craving to learn more. Did you come to India after getting your B.A. degree? I used to come to Bombay with my family once every two years, during the December holidays. After my second year of university, I came here, and my mum's friend was a film producer. My parents knew that I loved acting and they pushed me to meet her. Obviously, I didn't have the right look to be a Bollywood actress, and the lady told me to finish my degree and come back, and we would talk then. That's actually why I came back after completing my degree. I got in touch with a lot of creative people before I came here, and wanted to become an actor. 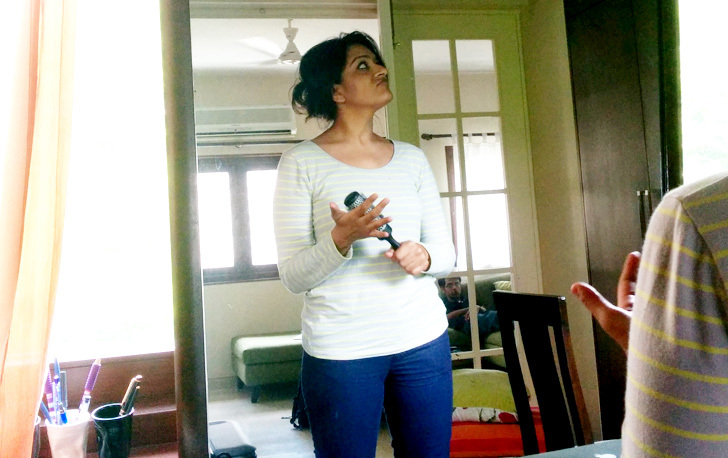 I tried getting a foothold in the theatre scene, and then I found Divya Palat's 'Imps' troupe. Did you do any plays in Bombay? I didn't do any plays, I got into improv with 'Imps'. But it wasn't really improv. It was all scripted. But it went really well. We were doing a lot of shows, and I decided to stay for another year. Did you enjoy doing the scripted improv shows? (Laughs) I shouldn't have mentioned that. But yeah, it was a fun experience. I met a lot of cool people, and it was my introduction to improv. How did you become a part of The Week that Wasn't with Cyrus Broacha and Kunal Vijaykar? Kunal and Cyrus had actually come to watch one of the improv shows, and at the time, they were actually looking for female actors for their T.V. show. They saw one of my shows where I played a weather woman who spoke in really bad Hindi. They loved it, and felt that the character would fit perfectly on their show. So yeah, that happened, and I eventually became a fixture on the show. And sometime around then I got married and stuff. Yeah, I got married. And then I felt that since I was married I should buckle down and get a proper job along with the T.V. show, so I got a job as a marketing executive with an N.G.O. I was on probation the whole time because I sucked so badly (laughs). I was a marketing and sales person and they didn't even give me my own business card because they weren't sure how long I was going to be a part of the company (laughs). Yeah, when I got married, I wanted to get a proper job, become a mom. I wanted that whole life, and I tried to build it but it didn't work out. After the N.G.O. job, which lasted for about eight months, I got back into improv through a great workshop, and it was my life for the next two years. Honestly, though, Arun, I wasn't doing it for my career or anything. I was just doing it because it was fun, and I had no ambition. I was playing outside the field. I thought I would become a mom and go for my T.V. shoot, and do improv in the evening, and all parts of my life would be satisfied. But then I got divorced in 2011, and I was like, urk, now what? That's when I really started concentrating and really focused on my career, and I decided to really pursue comedy. Were there enough opportunities for you to pursue comedy in Bombay at the time? I started improv in 2009, and English comedy in India really only started in 2008. Everything was very new, and stand-up comedy was also just picking up. People were really excited about this new comedy scene that was coming up, and a lot of bars and other venues were very open to having shows. "I've started doing some stand-up comedy on my own for the first time, and I think it's important." Do you prefer working as part of a group or do you like working solo? I've always done ensemble work and I love collaboration. I've always been a part of various groups, but it's only this year that I've realised that Kaneez Surka is slowly becoming a brand in its own right. I've started doing some stand-up comedy on my own for the first time, and I think it's important. If I build my brand, it's also going to aid my collaborative work. In India, when it comes to comedy, maybe I'm wrong, but I feel that audiences associate with individuals more than groups. Like, A.I.B. (All India Bakchod) is popular, but Tanmay's got his name, Rohan's got his name, Ashish, everyone knows them from their solo work. Stand-up involves a very interesting process. It's very different from improv, and I find that I have to use a different part of my brain. Right now I've got about 10 minutes of material that I really like, which I hope to grow to about 30 minutes by the end of the year. But I know that's going to take a lot of work. Do you have any sort of process that you follow when you're writing material for your stand-up routine? I started off as an improviser and a storyteller, so in the beginning, I started off telling stories and funny anecdotes. I learnt that that's not what stand-up is. It's not about sharing anecdotes, it's about finding jokes. It can feel a bit contrived, at least in the beginning, but as you get more established, you can move into a more real space. Right now, I'm still learning, so I want to learn the rules before I break them. At the moment, I write down every single word for my stand-up routine, which is the complete opposite of what I do for my improv shows. I work on my script meticulously. Do you practise in front of a mirror? Yeah, with a hairbrush [in place of a mic]. But it's been interesting. I'm not someone who's naturally meticulous, and it's really hard writing jokes. You're part of an improv group called the Improvisers, with Abish Mathew, Kanan Gill, and Kenny Sebastian. You guys rehearse for your improv shows quite regularly. Are these practice sessions just to get everyone used to each other's styles and iron out any possible kinks? Or do you have set objectives in mind for each session? Since we live in different cities, we don't get a whole lot of time together, so quite often, our rehearsals are to build the group mind and iron out possible kinks. But we have had sessions where we work on specific aspects of our improv. Like a session on character work or 'finding the game' in the scene. Out of the three or four times we practise in a month, we try to make at least one rehearsal a session with an objective. You've also been conducting improv comedy workshops since February 2014. Do you enjoy teaching? 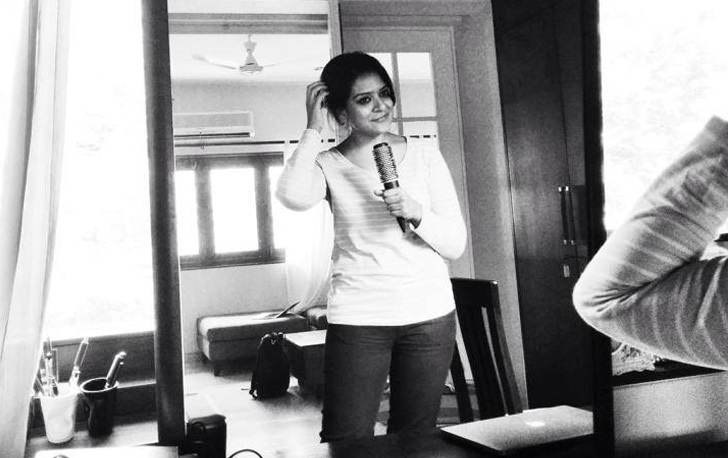 I have done around six workshops in Gujarat, Bangalore, and Mumbai. I love teaching and I love improv, so I really love teaching improv. I teach my students the basic principles of improv comedy. One of the sessions of my workshops involves creating a group mind — by that I mean doing exercises and playing games that help everyone get on the same page mentally. I love this part — this is where I see people let go of a lot of their inhibitions and really start opening up. I think improv does that in general, which is what I love most about it. You have to be able to trust and you have to be able to listen. 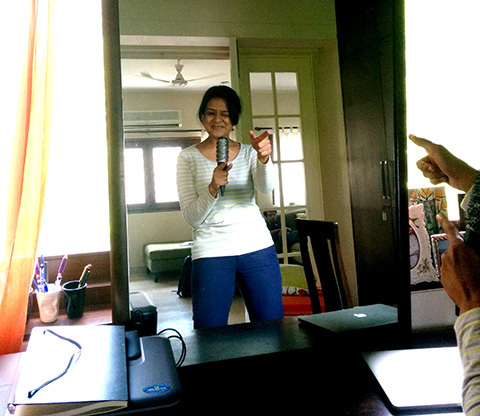 Dating Tips Fail featuring Kaneez Surka and Abish Mathew. You do regular shows in Bombay and Bangalore with the Improvisers. Do you find any differences between the comedy scenes in the two cities? The audiences aren't very different, but the comedy scenes are. The scene is smaller in Bangalore and the people involved in it are a lot closer. Bombay always has that cut-throat feel to it. People are very like 'we've got to make it big'. But that's something that's changing in Bangalore as well — because of the rise of the Internet, everyone wants to get their name out there. It's become this global platform; it's not city-based any more. Also, the comedy sensibility is different. In Bombay, people constantly make reference-based jokes — like Tusshar Kapoor jokes and other Bollywood-reference jokes, all the time. Manmohan Singh, Rahul Gandhi, etc. In Bangalore, I've noticed that they don't do that. They don't ever use names. Bangalore has more quirky, intelligent humour. I recently spoke to a Singapore-based comedian, who said that most comedians in India think that they've already made it big even if they've only been performing for a couple of years, whereas abroad, comedians have to work for 10 years or more to be able to say that they're even somewhat established. Would you agree? And do you think that the comedians here have big egos? Yeah, of course there are a lot of big egos. Do you know how insecure comedians are? God! (Laughs) We're very sensitive and insecure people. And yes, everyone says that. All the top comedians are like, "We've had to do this for five years, and then these kids come in..." I disagree, though. If you're doing well and that's the pace at which the comedy scene here is growing, then it's all relative, right? Three years here is equivalent to 10 years in the U.S. The market is not as saturated as it is in some other countries. Exactly. And it's filling up fast. But the people who are in the scene right now are the pioneers of the English comedy scene in India. I'm sorry you had to go through 10 years in your country, and that we only had to go through three or four years. And there are some people who take it for granted and they don't take it as seriously as they should, but honestly, in the next few years they'll fall out. It all evens out. It's a very volatile industry. If you don't constantly work on your craft, you will fall to the sidelines. "Jealousy's fine. Jealousy is normal, in every industry. It's a very human thing to feel." Do you feel that the Internet has become this big equaliser? Someone who has been doing comedy for a few years now has the same platform as someone who's just starting out. Yeah, for sure. I mean, Kanan Gill has been a part of the comedy scene for years, but he did this one online video which was well received, and now he's just exploded. And a lot of people were like, we've been doing this forever, and now this one kid comes in and gets all the attention. Is there any bitterness because of it? I'm sure. I'm sure that people are jealous. I was jealous (laughs). But hey, jealousy's fine. Jealousy is normal, in every industry. It's a very human thing to feel. There is some bitterness now and then, but people get over it. No one hates anyone. And the scene is too small to compete with other people. You have to focus on yourself and improving your skills. When you came to Bombay, you wanted to become an actor, and work in films and theatre. Are you still considering going back to that or has that taken a back seat? Yeah, I'm not even interested any more. After I got divorced in 2011, I just decided that I was going to be a comedian. My focus is improv. My niche is improv and my name is associated with improv, and I am committed to learning more and developing my skill. What is the one piece of advice you would give someone who's just starting out in comedy? I participate in a lot of open mic events, and a lot of the people there run their material by me. They'll tell me a joke, and I'll just ask them, what is the emotion behind what you're saying? Where is the joke coming from in your life? What observation did you make and how did it make you feel? A lot of times people just say jokes that mean nothing to them or have no context. Don't just say a joke. You need to connect with your comedy both emotionally and mentally. I'm not very technologically savvy. With whatever technology I own, I mostly just use the basic functions. I use my laptop, a MacBook Pro, for research purposes. I listen to quite a few improv-related podcasts. I use the notes app and camera on my Samsung phone a lot for recording my observations and making notes. For writing my stand-up comedy material, I stick to using a pen and paper. I prefer to use lapel mics and handheld microphones during my performances.